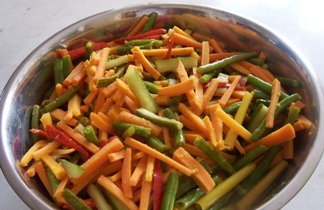 Yellow Pickled vegetables is a healthy vegetable recipe. We use them as a side dishes for much Indonesian food. Mie goreng or fried noodle is an excellent example where this low calorie vegetarian recipe mostly used, or savory martabak is very delicious with this dish. Heat the vegetable oil in the pan and add the smooth paste. Fry and stir it until fragrant. Add lemon grass, stir it for a few minutes. Remove from the heat when the vegetable are still crispy. The taste has to be sweet and sour.